What i saw in the past (75.20), that the voltage of the PV inputs differ. 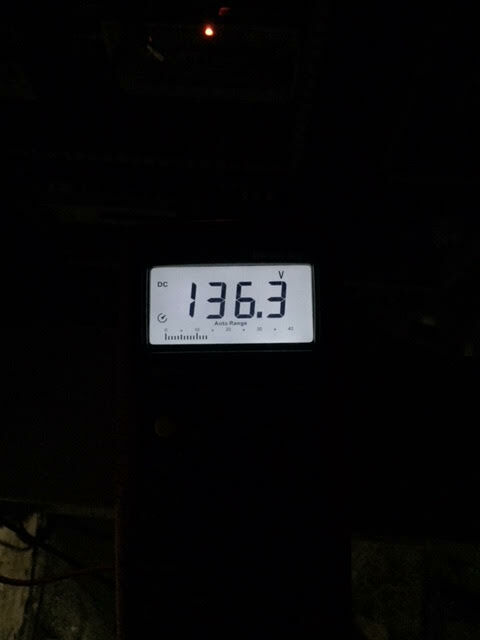 On cold and sunny winter days the inverter switched the pv input off and showed the failure number 13 on display. The displayed voltage was 152V....but the real measuered voltage at the pv input terminals was 136V. Also i saw sometimes during the night voltages on the pv input from 47V and 50V on the display of the inverter. Rik, the dual- and triple-MPPT models do seem to work somewhat differently to the single-MPPT models. I never see that weird behaviour [ edit: with my single-MPPT machine] with the PV voltage readings; it always reads zero at night, for example. In fact, at night, the single MPPT SCCs (Solar Charge Controllers) aren't even powered up. Perhaps they operate quite differently. In your photos above, is the 136.3 V being measured by a multimeter? I can almost read "Auto Range", which suggests that. I presume that it's connected to the same PV input as the Axpert/PIP is connected to? Also, are you perhaps connecting the two PV inputs together? This might make sense for testing or other purposes, but it might cause strange effects such as you are seeing. The SCC inputs (PV terminals) are not isolated from the battery, and therefore are not isolated from each other. So you are not meant to connect them together, or to any other charge controller. They will always be operating at different PWM ratios (even MPPT controllers use Pulse Width Moduation at heart), and so one PV input could be "pushing" the other PV input and possibly confusing the voltage measurement somehow. Though as I type this, it seems unlikely. you are right...the second picture shows a multimeter..and yes it's connected to the PV input 1 of the inverter. I didn't put both PV inputs together. On each input are 20 modules connected. Different from the average PIP video. If someone needed, i take the original firmware U1 73.00 for 4048MS and perhaps more. The U1 72.70 on this site cut off the cooling fan some minuts. And broke my inverter some days after. Those inverter are really heat sensitive. I think u must never stop cooling fan if u want ur inverter function long time ago. The version 73.00 sold this problem. One of the fan is always active. And the inverter is really more cold. Perhaps u can evolve the firmware join for saving the problem of bulk charge and other. Sorry to hear about your inverter. Thanks for 73.00. Now we have a lot of work ahead of us, porting our patches to it. One of our clients' PIPs was updating firmware very slowly. We were able to swap its comms board with one from another PIP to get the firmware updated, but the original comms board still needs fixing. To help find out what was going on, we did a partial trace of the comm board. We were not interested in the USB half of the circuit, so that that was not traced. I'm not convinced that I have the power supply right; it seems pretty weird. It seems that the design is a little marginal, which might explain why some people have been having trouble with certain combination of inverter/charger and USB to serial adapter. That's a nicely done drawing, Coulomb. There's more than one weird thing about that circuit. It looks like it was designed by an amateur. I count 12 parts that are completely unnecessary since they can either be omitted or replaced by a PCB track, sometimes requiring a change in the value or connection of other parts. Namely: Omit D5, D9, Q3, R12, R14, R18. Replace D2, R1, R6, R9, R10, R35 with PCB track. Increase R3 to 1k0. Increase R13 to 6k2. Connect the LED of opto U2 in series with R13. You show "To USB circuit". It would be interesting to also see "From USB circuit". Hi, all, been locked out for a while, but managed to read through quite a few pages over and over LOL. So a couple of months ago i weakened and bought a pip5048 PWM job, (dont drink while on ebay). Noticed that you (coulomb and weber) have been making lots of progress, congratulations. and would that be of any help in checking the code for the premature float bug which it sure has. We used to be able to read firmware from the DSP (inverter's processor on the daughter board) using slightly special equipment, as used to be posted in I believe the "if your inverter is bricked" post, but as of the last year or two they use a password to protect against this. So I don't think it's worth trying now. We've never attempted to read firmware directly from a Solar Charge Controller (SCC), though depending on the processor used, there may be ways. However, I believe that the latest SCCs use a "junior" (technically, one of the Piccolo TMS C2000 models), so that likely uses a password protection as well. Curse those clone manufacturers! I don't blame Voltronic Power for trying to protect their investment in the firmware development, but it makes it hard to DIY fix any problems. So if you are serious about reading firmware, or want to ask me to read it to check particular details, you need to find a firmware update file. The firmware versions you mention are totally foreign to me, and they are not close to the ones I've seen (and I have a bit of a collection these days). I've been running a pip4048ms with 240Ah of batterys (4s2p Ritah AGM 120Ah) now for 13months. I've just notice in the last week that the solar volts soon after sunrise climbs above the 115vdc which the manual indicates PV Array MPPT Voltage Range 60~115Vdc . 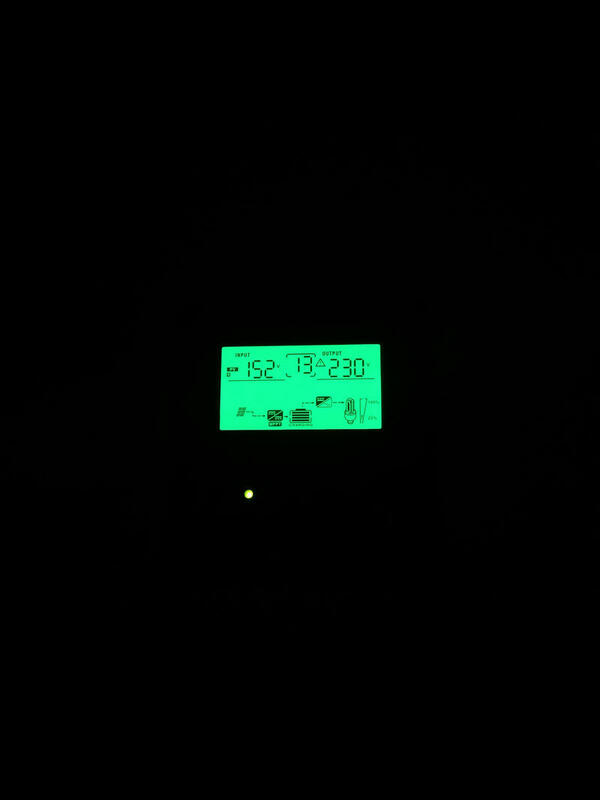 During this approx 2hr period there is no battery charging and I can hear a relay clicking every few seconds in the pip. I've attached a couple of graphs. I have resolved this on 1 occasion by shutting down the pip and restarting other times it has come good after a couple of hrs. Can anyone offer any clues on why the pip isn't charging the battery on some blue sky mornings? I have emailed mpp solar with no reply at this stage. Same issue again this morning. Blue sky, relay clicking in pip, Battery not charging. 2. wait a couple of minutes then turned on pip. After a short time ( a minute maybe ) pip would shutdown. 3. turn pip off then wait a bit then turn on. This time switched on solar. Pip relay clicking. repeat some combination of the above steps a few times without success. 4. Fired up genny. At least I have power and batterys are charging. Genny overload trips and pip switches to battery providing power but still no solar charging and pip relay still clicking. I turn off genny. At this stage have to leave so I leave everything as is hoping it will sort itself out. On my return I check and see that about 8:30am (same as previous morning) the pip behaves as normal with solar charging. I'm hopeful someone can shed some light on whats causing this. My next step is to check all battery connections. I'm thinking now its just the time of the year and angle of sun on panels in the morning. Last edited by al76 on Sat, 20 Jan 2018, 18:10, edited 1 time in total. We used to be able to read firmware from the DSP (inverter's processor on the daughter board) using slightly special equipment, as posted in I believe the "if your inverter is bricked" post, but as of the last year or two they use a password to protect against this. So I don't think it's worth trying now. We've never attempted to read firmware directly from a Solar Charge Controller (SCC), though depending on the processor used, there may be ways. However, I believe that the latest SCCs use a "junior" (technically, one of the Piccolo TMS C2000 models), so that likely uses a password protection as well. Curse those clone manufacturers! I don't blame Voltronic Power for trying to protect their investment in the firmware development, but it makes it hard to DIY fix any problems. The firmware versions you mention are totally foreign to me, so they are not close to the ones I've seen (and I have a bit of a collection these days). Hey coulomb thanks for the reply, I have emailed MMP, just wait and see. ATM I have stuck 1.5kw panels onto my GSL 60-1 MPPT controller, that has battery hitting absorption volts by about 10am. So at least a bit more stick into the 20yo flooded cells. They still get us through the night with A/C for a couple of hours fans TV etc.. Negotiating to buy a bunch more panels so see how that works out. Hi Johan. Thanks for letting us know that our patched firmware has been without problems for you. By "this version" I assume you mean LC1_72.70c. I remind other readers that you are running 3 inverters in parallel. We wish you well in your move to lithium-ion. Today we will begin the work of porting our patches to version 73.00, which should address some concerns about higher temperatures. But then it was running at 52.5 Hz. So at least the generator can pass through the PIP to power the loads while waiting for the solar to recharge the battery. In this case, with 6 kW of solar and a 20 kWh LFP battery for a household of one person (and a cat), the generator is unlikely to ever be needed, except possibly when the household's internal-combustion vehicle is replaced with an electric vehicle. Well, MPP have responded by email a couple of times. The latest has them asking for data log from watch power. So my questions, is data only logged when connected to pc or can i just down load a stored data file from the inverter? Have you guys already put some sort of instructions together for this. Wishing i had bought a 4048 instead of the sofware orphan 5058, though apart from the abasortion charge bit it is performing fautlessly. Has anyone tried a bluetooth or wifi dongle to connect the pip to pc? Not happy that the remote will do it all for me and messy to get the leads where i want it. As far as I know, the inverters don't store any useful information. There is a setting for enabling "record fault code", but I haven't chased up what that actually does yet. I suspect it puts something into EEPROM storage, perhaps the last fault or a few of them, accessible with RS232 commands. So data is stored mainly in the connected PC. Weber and I don't bother with WatchPower; we use our own Node-red software on a BeagleBone Black; others use ICC on Windows, or on a Raspberry Pi. So data is stored mainly in the connected PC. Weber and I don't bother with WatchPower; we use our own Node-red software on a BeagleBone Black; others use ICC on a Raspberry Pi or on Windows. Edit: I don't know what ICC stands for, and can't quickly find out, but I'm guessing that Inverter and Control are part of it. I am surprised that one Aussie don't know that ICC stands for "International Cricket Council"
Another option. I'm using a rasp-pi with some custom python scripts and graphing with MRTG. I have a problem with my pip4048ms. The solar charging doesn't seem to activate until late morning and full sun. I can hear a relay clicking every few seconds. Solar is 2 strings of 3 x 185w panels. This morning the charging didn't start until 11:45am when the sun finally came out. Yesterday it was after 1pm before charging started. Thanks for giving complete details of your system, both hardware and firmware, including batteries and solar panels. That makes it much easier to help folks with problems. 185 W panels are almost certainly 72-cell panels. Can you count 6 cells by 12 cells on each panel? If so, you need to rewire your PV array as 3 strings, with each string having only 2 panels in series. The problem is occurring because your PV array is producing too high a voltage when the panels are cool. As the air warms up and the panels get more sun on them their temperature increases. This causes their voltage to drop. Eventually the voltage is low enough to be safe for the inverter. The inverter can't tolerate more than 145 V from the PV array. We have been working on porting all our patches to version 73.00. One test-reflash last Friday properly bricked one of my inverters! We'd had crashes before, while testing our patches, but the bootstrap-loader had always worked and allowed us to recover. This time, none of the things Coulomb previously wrote about, for recovering from apparent brickings, worked. And in fact we no longer expected them to work, thanks to Voltronic trying to protect themselves from the Chinese clone makers (understandably). But Coulomb read an old version of the bootstrap-loader code and determined that there should be a 3.5 second window after a restart, before it hit our bad code and crashed. Then we determined, by sniffing the output of the reflash tool, running on the laptop, that there was a 12 second delay before the reflash tool sent its first command to the inverter. And it would retry every 2 seconds after that (for 10 tries). So we tried delaying powering up the inverter, after starting a reflash, and it worked! Hoorah! This could be a major breakthrough for anyone with a PIP/Axpert that they think was bricked during a reflash. Give it another try with this method! Yes they are 72 cell panels. The OCV is 44.3v. Thanks for this response. This sure does make a lot of sense and takes a load of my mind. Will I need to consider cable size with more amps? Is the constant relay clicking having any significant impact on lifespan of relay? Its Summer now, will changing string length affect winter situation?